Each week, Utah high school sports provides incredibly exciting moments, big wins, great plays and memorable accomplishments. This year, PrepsUtah.com will do its best to identify THE top story of each week in a segment powered by TOSH, The Orthopedic Specialty Hospital. Here, for the week of October 24, 2016, is our TOSH top story of the week. One of the most impressive team performances of the 2015-2016 high school sports year belonged to the volleyball team at Morgan High. The Trojans of last year ran off a 32-0 record against a collection of opponents that included every 4A and 5A powerhouse you can imagine. It was a great showing for the team that went on to win the Class 3A state title. This year, however, nothing was guaranteed as seven players from that dominating squad graduated, including the team’s top three hitters, its setter and its libero. Rebuilding, however, has never been a problem at Morgan or for its head coach, Liz Wiscombe. With this year’s title, the school has now claimed a record 17 state championships, with 14 of those coming under Wiscombe’s direction, and the coach won six more titles previously at Delta for a state-record total of 20 championships. This year, Wiscombe brought back senior Anna Cox, who was a big part of last season’s mix, and saw senior Brookelyn Hurlbut, juniors Marcie Stapely and Baylee Loertscher, and sophomore setter Ellee Anderson step up into much bigger roles. The result wasn’t quite 32-0, but it was a repeat state championship and a 27-3 campaign. 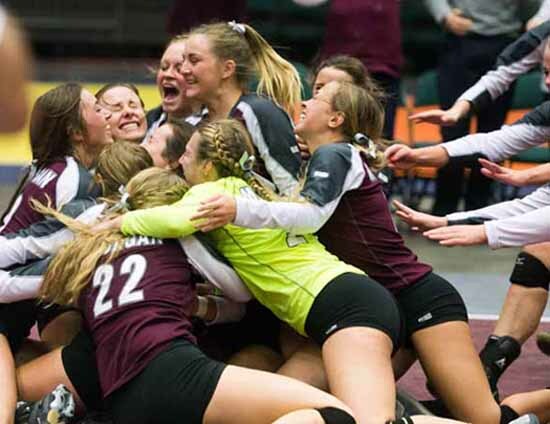 The Trojans lost just one set during their four state tournament matches, to Dixie in the quarterfinal round, but otherwise, it was a dominating performance once again. 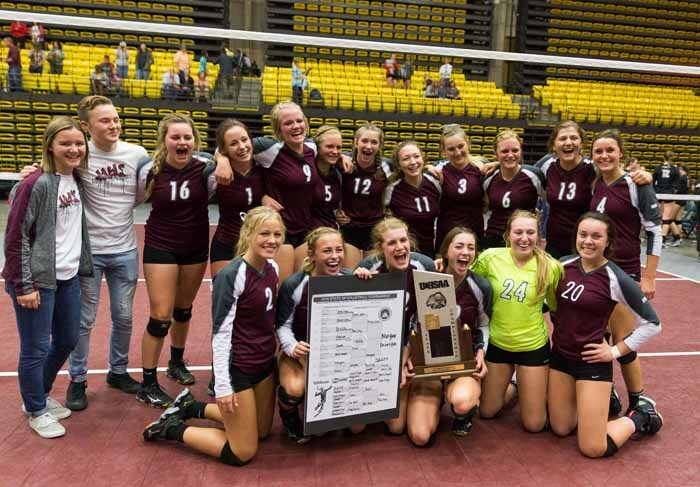 The championship battle with Desert Hills contested Oct. 27 at Utah Valley University, provided Morgan the opportunity to face off with a team that featured a significant height advantage, but even that didn’t seem to bother this team. The Trojans opened the title match with the intention of running the Thunder out of the building. Almost before anyone blinked, Morgan had a 14-4 advantage in Game 1. With Desert Hills on its heels, it took a while to respond. After completely owning the opening set and winning it 25-15, there were moments in the second and third sets when it looked like the Trojans were in trouble. Led by Cox, who had 14 kills in the championship match, Morgan seemed to thrive in those situations. It came from behind in each of those final two sets to finish off the Thunder in a sweep (25-15, 28-26, 25-21). Perhaps not coincidentally for a team that did not shy away from the size Desert Hills presented, the contest ended when Cox and Anderson blocked the tallest player on the court, Charity Bradley, to secure match point. The story of the championship match is the story of this team. While Desert Hills had its moments, the biggest moments belonged to Morgan and because of that, the Trojans hoisted yet another championship trophy.